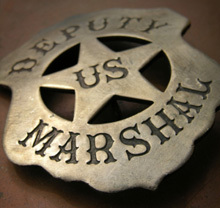 Bills have recently been introduced in the House of Representatives and the Senate to require the issuance of commemorative coins for the 225th anniversary of the establishment of the United States Marshals Service. The program would include $5 gold coins, silver dollars, and clad half dollars. The Senate version S. 431 was introduced on March 2, 2011 by Sen. Mark Pryor of Arkansas, while the House version H.R. 886 was introduced on the same date by Rep. Steve Womack of Arkansas. The first $5 million of surcharges raised from the sale of the commemorative coins would benefit the United States Marshals Museum planned in Fort Smith, Arkansas. In the previous year, legislation had also been introduced seeking U.S. Marshals Commemorative Coins. The previous proposal included $5 gold coins with one ounce of gold content, struck in high relief with incuse edge lettering. Silver dollars included in the program would have also featured incuse edge lettering. The House version of the bill gained 110 cosponsors, but was never voted on. The newly introduced bills include coins with specifications more typical of modern commemorative coins. The $5 gold coins would have a weight of 8.359 grams, diameter of 0.85 inches, and composition of 90% gold and 10% alloy, yielding 0.242 troy ounces of gold content. The silver dollars would have a weight of 26.73 grams, diameter of 1.5 inches, and contain 90% silver and 10% alloy. A half dollar was added, which would carry the specifications of half dollars issued for circulation. There are no requirements for edge lettering or high relief designs. The designs, in general, shall be “emblematic of the 25 years of exemplary and unparalleled achievements of the United States Marshals Service.” All coins would carry the mint date of “2015” and the anniversary dates of “1789” and “2014”. The final design selections would be made by the Secretary of the Treasury after consultation with the Director of the United States Marshals Service, the Commission of Fine Arts, and review by the Citizens Coinage Advisory Committee. According to the legislation, the United States Marshals Commemorative Coins may be issued to the public beginning on January 1, 2015. However, a “limited number” of coins may be issued prior to this date to the Director of the U.S. Marshals Service and employees for display and presentation during the 225th anniversary celebration in 2014. Both versions of the bill are currently in committee. In order for one of the bills to become law, it must pass the House and Senate, and receive the President’s signature.